Monday night, Dominic Monaghan posted a few photos on his Instagram. You may know Monaghan as Charlie from Lost, but he was also Merry in Lord of the Rings. 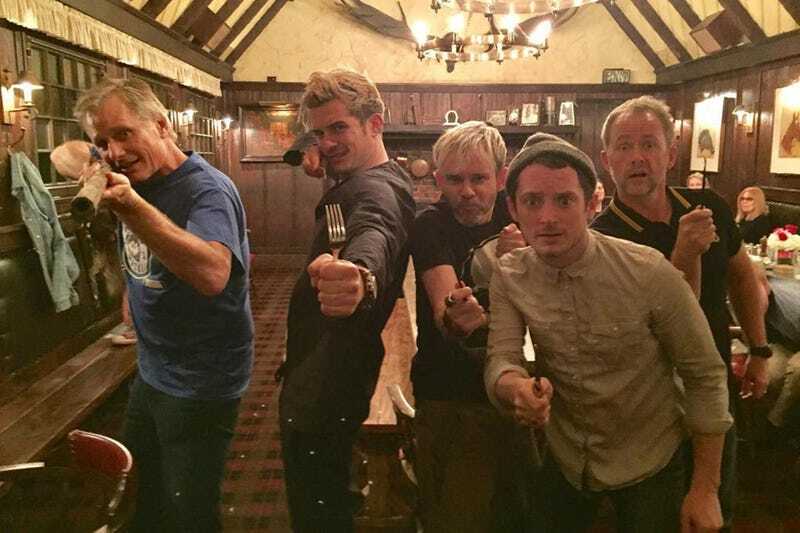 He was hanging out with Billy Boyd (Pippen), Elijah Wood (Frodo), Orlando Bloom (Legolas), and current Oscar nominee Viggo Mortensen (Aragorn), and decided to document it. That’s right, it was an impromptu reunion of more than half of the Fellowship of the Ring and the timing couldn’t be better. Last month marked the 15th anniversary of that first film in Peter Jackson’s Lord of the Rings trilogy. Here are the photos. Fifteen years later, moments like this are a blueprint for why the Lord of the Rings movies are so incredible. All the technical stuff? Yes. The script and direction? Of course. Tolkien’s story? Undoubtedly. None of that should be overlooked. Still, it was Jackson’s casting, and the fact everyone bonded so deeply during filming, that gave those characters life. You loved seeing each of them grow, cried when they departed, and cried again when they were reunited. You can probably count on one hand the number of huge blockbuster trilogies where the casts still hang out 15 years later. And now, the Fellowship is back together again. I’m well overdue for a full on rewatch. How about you?